We do what we do at FACES because of the people we get to meet and work with every day. Below are a collection of stories about our patients, staff, partners and adventures. Enjoy! Meet the Pena Cordova family. They are coffee farmers from Cajamarca, a day’s journey from the FACE’s hospital. Of the family’s six children, three had unrepaired clefts. 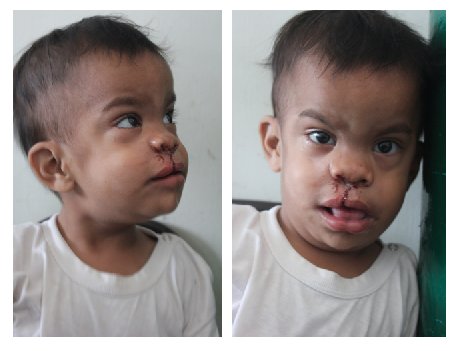 Following encouragement from the Lion’s Club, they received the surgery they needed from the FACES team. Life is not so simple for many of FACES patients. We choose surgical candidates who are from the most remote, isolated regions in the country. Christian is a patient who came to us via the Cafe Femenino Foundation, an organization that works with rural women coffee producers. The FACES team was afforded a delightful visit with Christian during the surgical trip, a wonderful surprise we were not expecting! FACES brought its first every Goodwill Ambassador to Peru in January 2013. Chris Dickey was a gracious, hard-working, thoughtful and fun addition to the team. Here, Chris Dickey discribes what it is like to spend a day with the FACES surgical team. Milagros de Fatima first contacted the FACES team via our Facebook page. We were surprised – we had never had a patient contact us over social media! 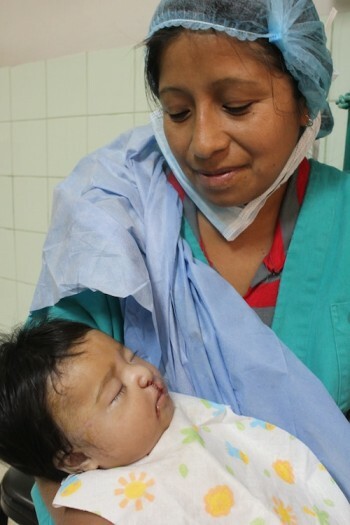 Milagros received cleft palate surgery on our January 2013 surgical trip. 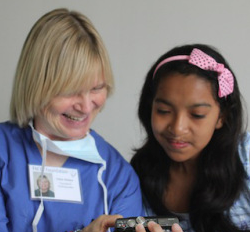 She quickly became friends with almost everyone on the FACES team and has kept in contact since her surgery. This story was written by FACES 2013 Goodwill Ambassador, Chris Dickey. Every day Milagros would sit in her classroom listening other students speak and wish it was her. Because of her cleft lip and palate, no one at school could understand her when she tried to communicate. 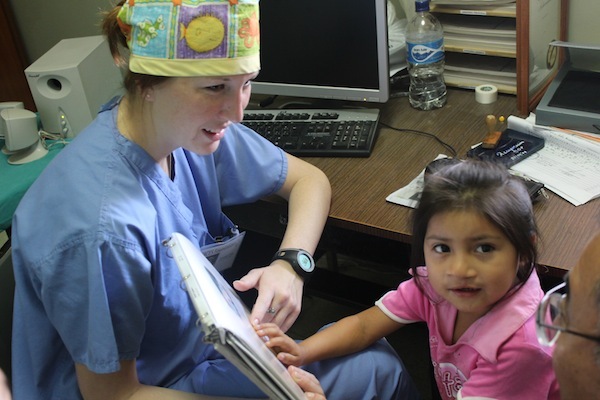 Now, a graduate of the FACES surgical and speech programs, Milagros can speak with ease and has since obtained a degree in Chemical Engineering. Although cleft lip and palate is one of the most common birth defects in the world, that doesn’t make living with one any easier. 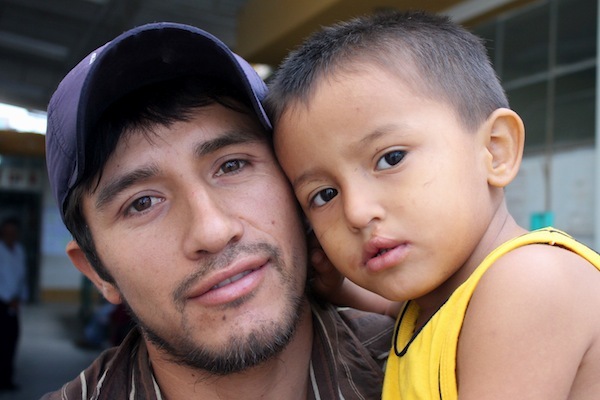 When Rafael was born, his mother immediately wanted to give him away because of his condition. 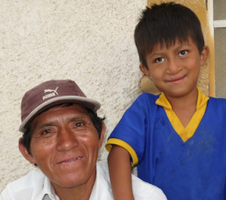 A distant relative, Corina, took Rafael under her wing and adopted him into her family. “How’s my baby?” Yovana Viera Silva asks nervously. Two hours earlier, her daughter Chalon was admitted into the FACES operating room to receive a cleft lip surgery from the team. Yovana and her husband wait in plastic chairs and each time a FACES team member, dressed in green and blue scrubs, leaves the OR she jumps up and asks again, “How is she? 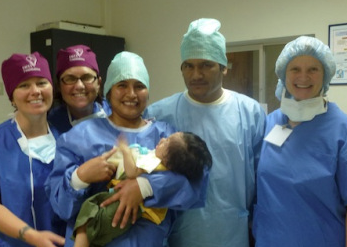 How is my baby?” Read about Yovana’s experience while she waits for her daughter’s surgery. The process of bringing a child to the FACES screening clinics, into surgery, through recovery and speech therapy is very much a family affair. It takes the support of caring parents, siblings, neighbors and community members to successfully help a patient through the FACES process. Adin’s story shows how a team of caring parents and supporters is necessary to make the dream of surgery and normal speech a reality. Can you imagine traveling through rugged countryside, over bumpy road and spending two nights on a rickety bus just to receive medical care? It’s something many of us in the western world will never understand, for when we need medical attention, we simply drive our car to the nearest hospital, which usually is no further than 20 minutes away. Here in northern Peru, the reality is different. Read about the Cajo family here.